What popped into my mind when I was looking at Estée Lauder stock (NYSE: EL) was an old Chemistry professor breaking down the entire beauty industry during a lecture. Basically the companies purchase these organic compounds that cost peanuts in bulk, mix them together to make the specific fragrances and perfumes and then stick them into a little bottle with a fancy label and name. Come the weekend you see the same finished products in the shops selling for huge markups relative to the actual cost of the chemicals. According to him the price of the compounds was of the order of pennies in terms of unit cost per bottle that they can then sell on to the public for say $40 a pop. For Estée Lauder that means the largest actual costs are in advertising and marketing. In financial year 2016, for example, it came to about $2.8 billion on total revenues of $11.2 billion. It’s kind of like the capital expenditures of oil & gas companies in that they must maintain the spending if they want to keep the earnings intact long-term. I mean I couldn’t tell you much about female beauty products: I know lipstick tends to be red, mascara tends to be black and that perfume tends to smell quite nice, yet I still recognize Estée Lauder and associate the name with quality. If the ad dollars dry up then so does that effect over the long-run, which is why these companies usually maintain their levels of marketing spending instead of cut them for the sake of short-term profits. It also represents a kind of scale advantage. I mean how many beauty companies can spend close to three billion dollars on advertising in a single year? Maybe two or three in the whole world? They can pay a small army of female celebrities to front their brand awareness campaigns – dominating billboards and TV screens in the process of promoting their products. Despite not giving a hoot about makeup products I can’t help but know that Kendall Jenner is a brand ambassador for Estée Lauder for example. If it gets through to me on some basic level then how do you think that affects the consumer choices of ladies across the globe? It’s raw marketing power and scale advantages that translate into high quality earnings. I remember trading a couple of comments with a guy on an article about L’Oréal stock a few months back. He said he wouldn’t consider it as a long-term buy-and-hold candidate because the beauty industry was suspect to changing consumer tastes. I think he was dead wrong though for the reasons above. The deal with Estée Lauder and L’Oréal is that they have premium brands, plus the scale advantages to either define consumer trends or they just adapt as necessary. The underlying business won’t actually ever go anywhere. It’s not like technology investing where you can literally see a business model destroyed because it has become obsolete. It would take a heck of a lot more to degrade the earnings power of these companies than say an Eastman Kodak for example. Part of the reason why folks might not get exposure to Estée Lauder stock is because it doesn’t have the longevity of some of the other names in personal care. I mean it’s only been publicly listed for the better part of part of twenty years. Likewise L’Oréal, which only listed on the Paris exchanges in the 1960’s despite tracing its roots back to a young French chemist in the very early 1900s. 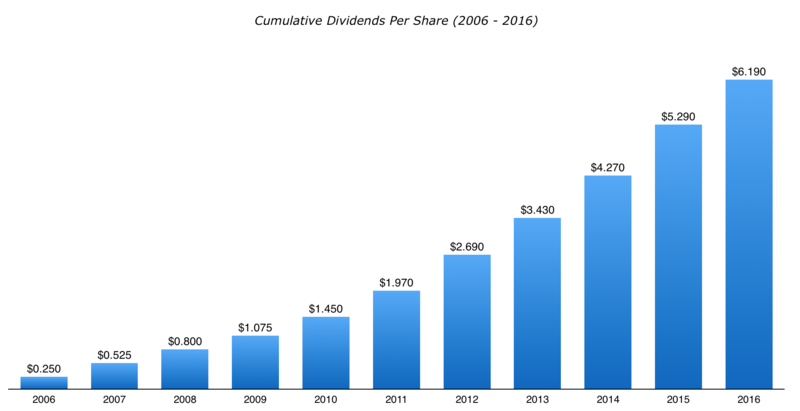 Check out Estée Lauder’s dividend growth over the last ten years though. It has grown by 15% per-year on average, still represents less than 40% of net earnings and anyone buying back then would be looking at a yield on cost of 7%. All while the underlying business brings in average returns on capital of about 20%. Ordinarily when it comes to the household goods sectors you’d probably never consider Estée Lauder stock for a dividend portfolio because there’s never any real need to look past Unilever and Procter & Gamble. They have the advantage of controlling a good chunk of the personal care and beauty industry themselves whilst also being diversified into other product categories. They report high quality earnings, pay out nice dividends that tend to rise over time and have done so for decades. The way I see it is that if we’re talking only one or two places for household goods stocks in a dividend portfolio then, yes, you should probably opt for the diversity of Unilever and Procter & Gamble. In all likelihood you wouldn’t ever need to look any further, especially combined with the high quality food & beverage giants like Nestlé, Coca-Cola and PepsiCo. They are core stocks that you can buy and leave alone for fifty years without ever worrying about them. Even in times of really choppy economic conditions you just sit back and collect the dividend cash, safe with the knowledge that products like Tide and Knorr won’t be going anywhere in a hurry. With those dividends you might then build positions in say Estée Lauder stock and/or L’Oréal stock in times where the value is attractive enough. Since pretty much all the high quality consumer goods stocks are at historically high valuations – and unfortunately Estée Lauder stock is no exception – then that’s probably not going to be right now. Compare that to just seven years ago. During the global financial crisis you were probably looking at a forward P/E ratio of somewhere between 10-15x earnings with double digit revenue and profit growth. You then had the perfect duo lining up for great forward returns: probable value multiple expansion and long-term earnings & dividend growth. The stock has returned 33% on average per-year since, with 2009 bargain hunters enjoying at a 10% yield on cost today. Today the stock is trading at 27-30x annual earnings. Growth will still be solid, but not enough to burn off that high valuation whilst still providing great returns. It reminds a bit of Lindt stock which also has a monster P/E ratio and finds itself in the same position. 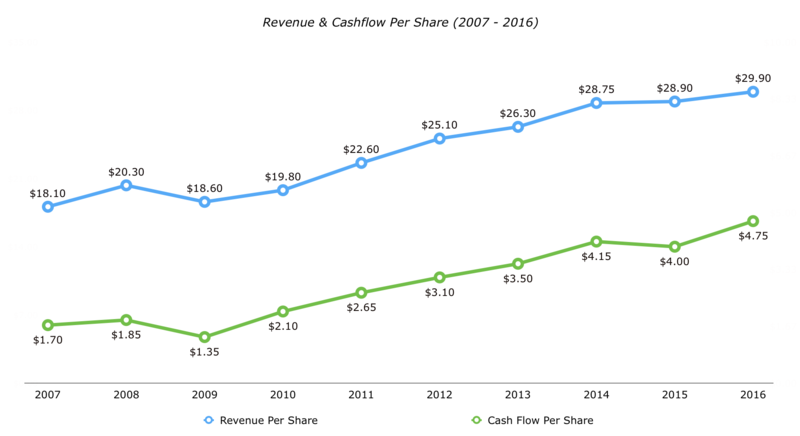 Both are great business and great companies, but the alternatives are much more attractive for a high quality dividend portfolio right now. Even if it were at something like 18-20x earnings you wouldn’t get to say it’s cheap, but at least with 10% average earnings-per-share growth it is still in the realm where you get good returns. At 30x earnings and 1.3% dividend yield you’re not really in that position, which is why it’s probably better to keep Estée Lauder stock on the watchlist right now for more attractive entry points.